This book really hit home for me. Without really putting a finger on it, the last few months I've been striving for something...trying to better myself and find my "happy place". My life has been kidcentric the last four years, and before that workcentric, so I haven't had much time to self-reflect and "just be me". Starting this blog, reading more, writing a list of Resolutions (my first ever), were all part of my desire to get a grasp on life and hopefully make it more fulfilling, and ultimately, happier. This book pretty much lays out one woman's journey to make happiness a priority-- happiness that starts with the basics and soon extends to her family, friends and even strangers. Happiness in a "pay it forward" kind of way. 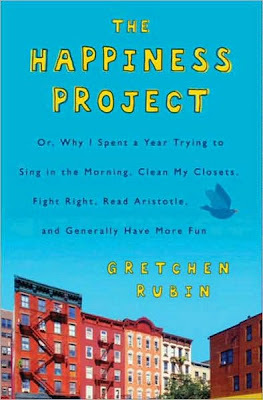 I can really identify with the author-- Nothing horrible has happened to me or my loved ones (at least not at the time being), no depression or illness, no REAL sadness... but yet, there's a little voice that keeps saying "you could always be happier". Have you heard the saying "you don't appreciate what you have, until it's gone"? Well, I want to appreciate what I have... while I still have it!! Furthermore everyone knows that happy people do more for others, are more even keeled, are more productive... the list goes on. And for all those naysayers who scoff at such "shallow" pursuits... It's much EASIER to be a critical and morose person than a happy one-- Happiness is not fluff, it takes work! Just so you know, I don't read self-help books-- they just don't draw me in. I wouldn't call this a self-help book... maybe memoir and self-help inspiration? or self-help lite? Anyhow, she does all the "self-help" reading for you so you can just take away the important parts... I like that! I can't even get through most parenting books and only turn to them when I have a specific issue that I need to tackle. This book is real, insightful and not preachy, but backed-up with solid research and good humor. However, it did take me longer to read since I was highlighting, taking notes and bookmarking my Kindle like a mad woman. Hopefully I'll be able to apply some of her strategies and start my own mini Happiness Project!